Two cousins work nights at a local mall as security guards. When their house is robbed on Christmas Eve they team up to track the robber down. Old man w/ shotgun: Come on out there! I know you're in here! Old man w/ shotgun: Respect my gangster! Q: Will there be a fourth Friday? Q: What DID happen to the last two security guards? Ice Cube is my hero! 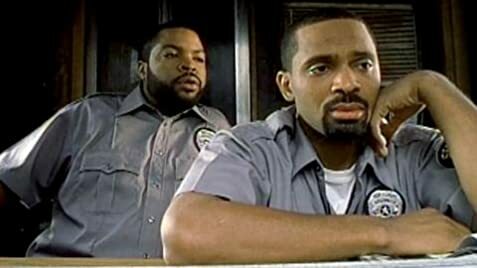 The third movie in Ice Cube's "Friday" series, this was the funniest of the three so far. The film takes place on Christmas Eve (on a Friday of course). Craig Jones and his cousin Day-Day have been robbed by someone going around dressed like Santa Claus and have all their gifts and rent money stolen (and their recreational drugs confiscated by the cops). It puts a damper on the day, where they have new jobs as mall security officers. So we see them through their day, wondering if they'll get their revenge on the burglar and seeing the hilariously overdone sterotypes in the film. Most of the characters from the first two film and their idiosyncrancies are back, like Craig's father and his bladder problems. There's also Maz Jobrani's Moly, playing a stereotypical Asian character whose broken English was a gas! Probably even more hilarious is the sheer sight of Katt Williams' Money Mike who plays someone that is a cross between Snoop Dogg and Spike Lee. Also, I just loved the wardrobe; I'd love to get a pimptastic suit. Ice Cube is good here, as he plays the only normal character in a world full of crazy people; I could feel for him. The acting was overdone, but it was done like this on purpose and so I could accept it, besides, the dialogue was funny. Ice Cube has a superb sense of humour. It's only about 82 minutes, so it doesn't overstay its welcome, either. And once again, Craig proves you don't have to be overly handsome to get the ladies. Very good comedy!